Catalina (Joy) Orchard passed away this 22 day of June, 2018. She was born in the Republic of the Philippines in 1951. 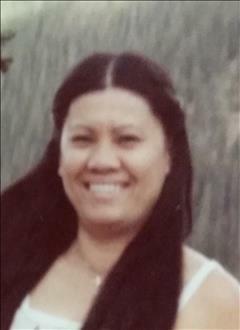 She is survived by her husband of 41 years, Larry Don Orchard, her sisters Lorie Pablo (Philippines) and Viola Wallace (Las Vegas), nephews TJ Velasquez, Dylan Velasquez, and Mike Wallace (Las Vegas), and niece Vanessa Wallace Rogers (Seattle). She loved cooking for others, playing board games and cards, and hunting and fishing with family and friends. She worked at AMI from 1977- 1980 and Farmers Insurance from 1990 to 2009. Joy died quietly at home from the long slowly degenerating effects of a stroke in 2010. A memorial service will be held at Central Christian Church, 918 E. Center St. in Pocatello, on June 30th at 11:00 am. Receiving family and friends at 10:00.